I saved and scanned this blurb from yesterday's NY Times for a few reasons. #1: To restate the obvious, hockey players are fearless. 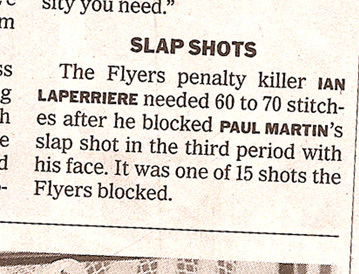 #2: To point out again that hockey players are tough. #3: Volunteering to put your body between a 70 MPH frozen projectile is crazy. #4: Because sometimes reporting the facts can be funny. PS: Ian Laperriere, get well soon. Bloddy video of the blocked shot on the jump. Ouch. You can see the blood on the ice as he's getting up. Lost like 7 teeth too. said E on April 25, 2010 4:39 PM. This is why I've always played goalie, and never understood why anyone wants to play defence. Give me the maximum amount of protective equipment, and I'll stand in the way of the puck. But with half the equipment? Fire away, guys. Fire away. said USELESS MAN on April 26, 2010 2:16 PM.